“Gateball” is a Japanese sport not unlike croquet. Players use a long mallet to hit balls through three gates in a particular order and then hit a goal post to score and finish their round. It is a team-based sport, with up to 5 players on each squad. One team wins when either every player on the team has hit the goal post, or time has run out. Appare! Gateball is the only video game based on the sport that I’ve ever played, and in fact I had never heard of the sport prior to playing it. You can choose either “Action” or “Simulation” mode, which is really the difference between playing and coaching. In action mode, you have to aim the ball and set the power with which you are going to hit it. Hitting the ball with an improper amount of power (missing the mark on the stroke meter) causes the ball to drift to one side, not unlike most classic golf games. In simulation mode, you simply decide where the ball is to be hit, and the computer-controlled player actually executes the stroke. I found the game to be much more fun in simulation mode, as it is seemingly impossible to hit the ball straight in action mode. 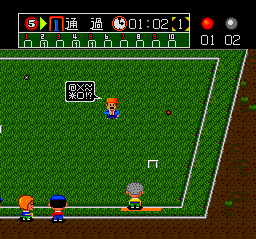 After choosing a mode, you decide to play on either a grass or clay surface, and then choose your 5 team members from a larger pool of players. Each player has strengths and weaknesses, but they all look crazy. This game is certainly going to be boring to a lot of people, but in a lot of ways it reminds me of a billiards game, except with more strategy. Tap an opposing players ball and (just like croquet) you can take a second shot where you smack their ball out of bounds. This game seems like it would be great fun to play in 2-player mode, especially since the computer AI is unforgivingly hard to play against. Appare! Gateball has colorful graphics with detailed playing surfaces, and catchy if not repetetive music. The single player game may not be the most exciting thing in the world, but the 2-player mode makes it a good party game, and at less than $10 it’s cheap enough to take a risk on. Buy Appare! Gateball on GameGavel or Amazon. Tagged Appare, Appare! Gateball, Billiards, Croquet, HuCard, nec, PC Engine, Sports, turbografx-16, West One. Bookmark the permalink.